November has actually been a fairly quiet month on the competition front after such a busy year. Detonator had his well earned rest after France and enjoyed a couple of weeks off then hacking, but he is now back at it preparing for Addington High Profile show in January and regional finals in February. It’s nice to have some time out of competing to work on new movements and really trying to improve and polish off everything else. After such a fantastic year, our debut competing for GB, first trip abroad, winning the Petplan Inter1 finals, competing at HOYS, fantastic regional and Premier league results, I’m not sure how we can top that in 2017 but with lots planned we will give it our very best shot and hopefully just enjoy every moment as we have done this year…..having an amazing journey, living a massive dream!! The two young boys have been out getting their last few regional qualifications. They both did very well at Port Royal winning 3 classes and Mario Lanza got his first report in horse and hound, he is really growing in confidence we just need to get to a few different venues, hopefully Bishop Burton, (which is a very spooky venue) a few times before regionals in February. Mario is qualified at novice freestyle, Sandonista has qualified for three classes, Elementary gold and freestyle, plus novice freestyle. Detonator has 2 freestyle classes as well so it will be a busy few days for them all. 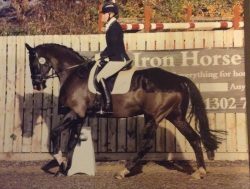 I have now got my 4 yr old back from breaking, he is homebred, I was still eventing at the time of breeding him so although not bred for dressage he has actually got quite nice paces. I’ll hopefully get him out to a few local competitions soon and if I’m feeling brave might get my eventing pants back on and event him a little bit next season, if he is not sold before then so I can afford to compete the others! There was also a lovely write up on me in the last British dressage magazine for the Northern area. Competing on the area teams has played huge part of getting to where I am now. I’ve met friends for life and gained valuable experience doing them and I urge others to go and give it a go. I hope everyone has a fantastic Christmas and new year, I just want to say a massive thank you to everyone that has supported me this year, your fantastic sponsorship, all the messages of support and the people that helped finance my trip to France I can’t thank you enough. The messages on social media have helped me so much especially at HOYS when I was so nervous. Here is hoping 2017 is a good one for everyone! !